Experience the warm and friendly atmosphere of the entire venue. The title of the Estonian pavilion, “Gallery of _”, symbolises the nature of the entire pavilion and, more broadly, the idea that Estonia is a dynamic and smart small country, with every citizen’s initiative but also every foreign investment, collaboration with international reach and foreign investor affecting how it fares. “Gallery of __” is an open platform for creative Estonian people, who will fill it with life and content. 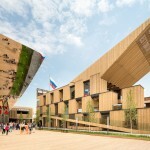 The architecture of the entire pavilion is created based on the idea that it should create the best conditions for holding various performances, exhibitions, actions and presentations. 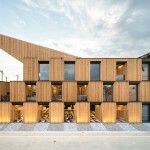 The pavilion will not be form for form’s sake but rather a framework for content that will bring the building to life. More broadly, an open platform also means a transparent and flexible business environment that favours new initiatives, as well as responsible connection to global processes. Upon closer inspection, this idea informs all the activities and initiatives that we are proud of in Estonia and that we wish to zoom in on the 2nd floor of the pavilion, in rotating themed exhibitions: a separate exhibition area will be provided on 2nd floor of the pavilion for the focused presentation of innovative companies, e-state solutions, green rural enterprise, rural tourism, creative sectors and fine arts. All presentedthemes and stories told by us will be intertwined with the pervasive theme at the pavilion: Estonia as a country of nature, creativity and innovation. The pavilion will be linked to the main theme of the EXPO, “Feeding the Planet, Energy for Life”, by the green execution of the pavilion and the subsequent recycling of its modules, a food programme paying tribute to organic Estonian raw ingredients and talented chefs, and thepermanent exhibition recounting on both the ground floor and 2nd floor, Estonia’s stories born in nature, given a novel form and functionality by means of contemporary technology and design. Guests at the pavilion have free choice of what activities, facts or stories to weave into their personal experience of Estonia. The most important thing that anyone entering the pavilion should remember is a warm, open and hospitable atmosphere, laced with exciting facts, gripping stories, rare sounds of nature, elegant technological simplicity, tasty bites and good music. The pavilion is created to be a multi-functional environment for holding performances and presenting creative output. The space will draw its meaning and atmosphere primarily from events held at the pavilion (concerts, exhibitions, presentations, conferences etc). The architectural premise for the pavilion will be a space with a clear identity, enabling visitors to get an idea of what Estonia is about. The pavilion is structured as a gallery of nature and creativity. 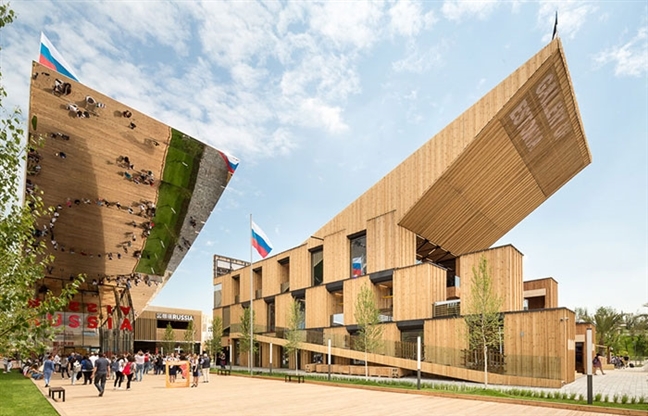 The pavilion composes of “nestboxes” stacked off-centre like cubes, forming the main volume of the building towards the Russian pavilion and along the side of the road inside the quarter. A “nestbox” is a high room creating a chamber-like sectioned-off area of space. After the end of the EXPO, these modular-assembly elements would travel back to Estonia and be used there as children’s play grounds, natural viewing points or, for instance, bus stop shelters. Theoretically, it will be possible to dismantle the entire Estonian pavilion and to set it up in the exactly the same form in Estonia. The main opening of “Gallery of_” towards the south, Decumanus, entry from which, under a high, lofty awning, along with the spacious interior creates a powerful experience. Additionally, there will be entrances from the plaza to the north and between boxes from the street. With its openness, the pavilion both invites EXPO visitors and allude to Estonians’ openness to innovations and the world. The building will have three floors. The ground floor houses a kitchen with ancillary premises, bars and a souvenir stand. Furthermore, “nestboxes”, forming cosy “compartments”, which together with the rest of the exhibition space on the ground floor provides visitors with an opportunity to quench their thirst for information about Estonia. Immediately upon entering off Decumanus, there is an area planned for a stage which, consisting of 1.2 x 1.2 m modules, will be flexible and capable of being readily re-arranged as needed. Access to the 1st floor will be provided by a narrow stairway will lead along the west side of the building and an airy double-flighted stairway from the centre of the building. On the first floor, the main exhibition area profiling Estonia, our entrepreneurs and sectors, where visitors will be able to explore in-depth sectoral achievements. Similarly, the first floor will house a “rye bar” recounting the story of Estonia as a unique country producing clean rye. The 2nd floorhouses a roof garden where plants and trees characteristic of Estonia set the tone. Plants are placed in dedicated containers with space in between for walking or sitting, inviting visitors, for instance, to also have a picnic, if they so desire, with a picnic set bought from the ground floor to take away. Access to the 2nd flooris provided through the stair wells on the north side of the building. 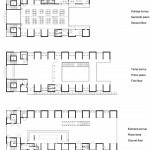 Adjacent to the rear northern side of the building above the small plaza, a lounge has been planned for holding business meetings for a smaller group of people in a cosy setting on soft furniture with a view of the garden on the 2nd floor. In addition, the second floor houses utility rooms and premises for the staff and management of the pavilion. All three floorsare inter-connected by stairs, with the main stairs open to all and the rear stairs used as escape stairs or by staff moving between various floors. Furthermore, a platform lift will be installed in the building for mobility-challenged persons. 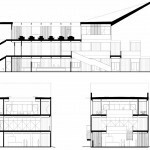 The interior architecture design is based on a single comprehensive design for the exterior and interior space, doing away with boundaries between the two. 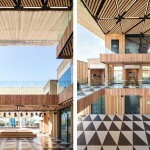 Comprehensiveness is emphasised by the copious use of wooden surfaces, creating rhythmic repetitions along with the pixel structure of the building. 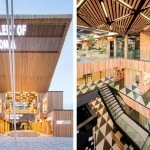 The design of the space has been created to be as multi-functional as possible, so that it may be re-arranged according to need and the programme happening at the pavilion. The interior design will be simple and intended as a neutral backdrop for the widely used LED-screen presentation space in the interior. Based on the rationale for the space, wooden box modules will employ various standard designs: swing module, presentation modules with LED screens on floor 1, rotating exhibition module on floor 2, conference room module and blocks of ancillary premises. The open general area on the ground floorwith a green counter of potted plants create a fresh and flexible space enabling various programme events to be held. The general area on the ground floor is bordered by rhythmically alternating energy swing nests and permanent exhibition nests with LED screens. Near the block of ancillary premises, there are drinking fountains of clean water for visitors. First floor provides more privacy. In the middle, there is a rye-themed bar and an area with suspended chairs for hanging out, complemented by groups of tables with bar stools for conversation and supporting food or drink. 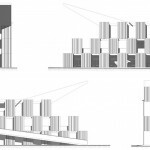 The spatial rationale of floor 1 continues, with exhibition space alternating with private energy swing nests. The roof garden on the second floorare open to all those interested; it is bordered by conference rooms for invited guests and meeting appointments. Between plant boxes in the roof garden there will be provided sitting modules and an oasis with a dime and warm lighting design. The roof garden is surrounded by a gallery with an awning, giving access to the block of offices / conference rooms. The concept of nooks and crannies and of private nests for the entire building will be supported also by the lighting design at the pavilion, which will be automatically adjustable according to the natural night / day light conditions.